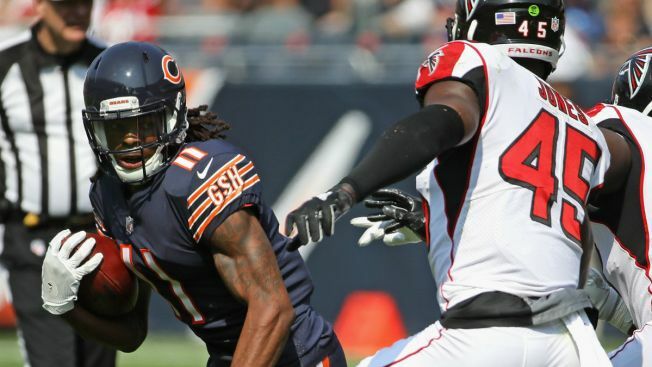 The Chicago Bears lost wide receiver Kevin White to an injury on Sunday, but a report suggests that the team could be without him for a lot longer than that. According to ESPN’s Dan Graziano, the Bears are worried that White broke his collarbone, and that he will require season-ending surgery. White was forced out of Sunday’s loss to the Atlanta Falcons after he was sandwiched on a hit by numerous Falcons defenders. He was taken to the locker room shortly after the hit, where he was diagnosed with a shoulder injury. If White ends up missing the remainder of the season, he will have played a total of five NFL games since he was drafted with the seventh overall pick in the 2015 NFL Draft. He missed that entire season with a shin injury, and only played in four games a season ago for the Bears.